The Centers for Disease Control and Prevention (CDC), the Food and Drug Administration (FDA) and U.S. Department of Agriculture (USDA) report their 2010 target goal for reduction of E. coli O157 cases was met significantly ahead of schedule. Overall, a major decline in foodborne illnesses was reported in 2004. Campylobacter cases fell by 31 percent, Cryptosporidium by 40 percent and Yersinia by 45 percent. Salmonella infections didn’t have as significant a reduction but still fell 8 percent. According to the FDA report, “To better control foodborne pathogens in animals and plants, prevention efforts should be implemented across the farm to table continuum.” USDA Secretary Mike Johanns explained, "These results demonstrate that through innovative policies and strong and consistent enforcement of inspection laws, we are protecting the public's health through a safer food supply." Reasons for such significant declines in foodborne illnesses were linked to several factors. In 2002 the USDA's Food Safety and Inspection Service established new recommendations for combating E. coli O157 in ground beef and Listeria in prepared foods. 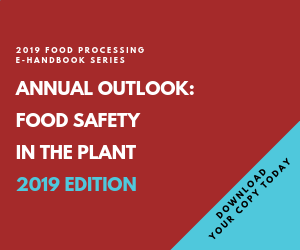 Most establishments responded with enhanced food safety systems, adding new food safety technology and increasing testing. These changes also are believed secondary to industry endeavors to reduce E. coli O157 in cattle and slaughtering. For more information check out the CDC web site at www.cdc.gov/mmwr.